This one felt fantastic. The last time I let out such emotion at the end of a race was in 2009 at the California International Marathon where I'd finally broke the BQ barrier. This day, there was no medal, nor podium, but I crossed a finish line for only the second time in 2016. The nearby crowd was probably thinking, "rookie," "pretend like you've been there before," or "what's with that guy...he's in the last third of the pack?" 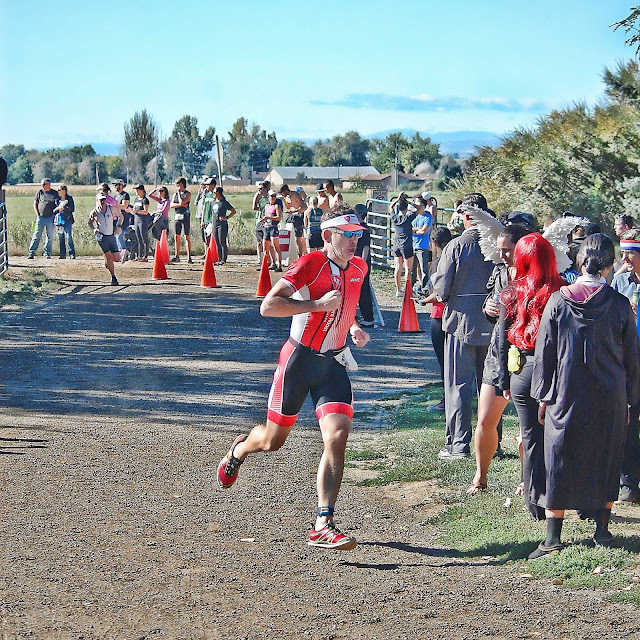 (The later had more to do with when my age group took off at Longmont's Oktoberfest Sprint Triathlon this last Sunday.) Regardless, I let out 2-3 guttural screams without audible words upon crossing the finish line. The "monkey was off my back." I want to (literally) put all my injuries behind me, but it's impossible to avoid the impact it's had over the last two years. A month ago, my foot did not seem right yet and my race season seemed to be over just as it started. As I wrote last week in Cupcake Runner, I've worked damn hard to get back. That's what makes it so much more satisfying. For the second year, I made the local Runner's Roost triathlon race team, but had been unable to wear their colors. I was bound and determined to change that. 1) As my coach would have prescribed, I did a few strides of speed work the day before to get my fast twitch muscles ready. 3) The strides helped, but the practice did not. The "bike out" area was quite rough with gravel and dirt. I nearly "biffed it" mounting my bike and ripped off a hunk of my left (why is it always the left foot?) big toe. 4) I hydrated well with SOS Rehydrate before the race which proved important. The bumpy road leading out of transition popped out my Profile water bottle on my tri bike in the transition area. I decided not to stop and grab it. I was worried I'd regret this. 5) This would be my first wetsuit open water swim of the season and only second open water swim of the season--six days earlier. Without getting injured, I would have had a full summer of open water swimming to work on navigation and sighting. Not thinking I'd return to racing, I simply didn't swim in the open water, but did a lot of pool swims. 7) My 12.9 bike ride was strong. Not sure how I did it without hydration, but again, I was thankful I loaded up prior to the race. My goal on the bike leg of my triathlons is to exceed 20 MPH. Goal accomplished. My mind settled with the fact that it would be around 40 minutes (mile one of the run,) before I'd get a reward of liquid. 8) My run leg (or should I say legs) was also strong. I wanted to be in the sub-seven minute per mile pace. All the side leg lifts, planks, side planks, and knee bends over the last four months of rehab delivered dividends. I felt strong. 9) My goal on the run is to always "pick off" those ahead of me on the course in my age group. For my runner friends or those not familiar with triathlons, they mark your age on the back of your calf so competitors know who's ahead or behind you. I didn't get passed, and I passed several including three in my age group. After my primal scream at the end, I'd learned quickly that I'd finished eighth in my age group. I always have a stretch goal of grabbing an age group podium, but my "three props on a four prop boat" swim killed any chance of that. For once, I was okay with that. More than okay, I was ecstatic! 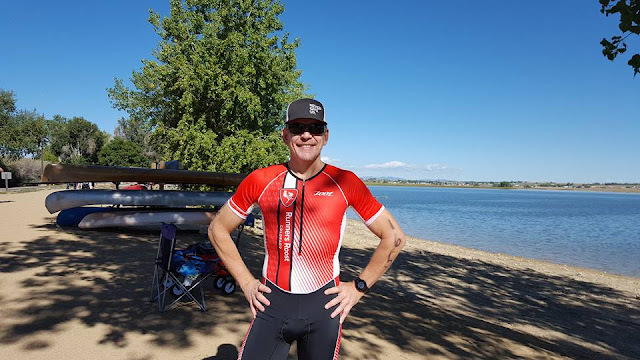 As we exited the parking lot, a fellow athlete gave me one of the best complements I could expect, "you are fast!, I tried to catch you on the entire bike leg!" Nice to hear from a stranger. Up next? Runner's World Half & Festival in Bethlehem in October, and facing my Nemesis race; the New York City Marathon in November. Bring it on! Editors Footnote: I parted ways this week with a blog vendor relationship. It wasn't exactly amicable. I doubt she will read this. If she did, she would know more about me and the adversity I've had over the last two years. If it's not clear, I love my blog, but the blog is way down the list below my family in terms of priorities. I have had a hard time remaining focused on my blog this last year. It's tough to write about running when you can't run. Nine of the last twelve months did not include running. Two foot fractures and starting the year recovering from skin cancer surgery had me more than a bit off. I also have three kids in college this year (for the first time at the same time.) Not ironically, I've worked harder than I ever have with my career to provide for their education. This week I took my 71st flight of the year. I do that because I have my priorities straight--to take care of my family. For those that travel, you know this is quite tiring even without training. If I don't seem "dedicated," you don't know me. I have also focused this year on my run buddy Liam (from IRun4 Michael organization.) What little spare time I have left, I send him a note. He will never run as he's confined to a wheelchair and had over 100 operations due to water on the brain and related issues. My parents probably don't hear from me enough, but I try, so sorry if I didn't log in often enough to your portal. Don't ever question my dedication, priorities, or sense of community. Too busy for you? I might give you that.